State Senate Majority Leader Russ Decker says changing how Milwaukee schools are governed is a major public policy change which will require diligence by lawmakers. Meeting with reporters at the Capitol Thursday, Decker said he is not opposed to the concept of having the mayor of Milwaukee in charge of the city’s public schools, but that lawmakers in Madison need to move cautiously. “This process needs to have community buy in, and I think it’s very important for that. The conversation is getting more and more intense, and I think people need to flesh it out, not only lawmakers but the citizens of the Milwaukee Public Schools area,” Decker said. Decker said that means public hearings will need to happen in Milwaukee, and Democrats representing the city in the legislature will need to be on board. “We’re going to be very diligent on this thing. 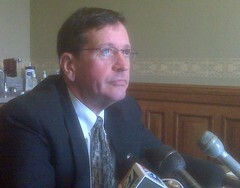 This a major public policy change,” Decker said. “There’s go to be community buy in.” Decker said any public hearings would be up to Senator John Lehman, the Racine Democrat who chairs the Senate education committee. Also on Thursday, Decker said he’s ready to more ahead with drunk driving legislation. “What we passed (in the Senate) is nearly identical to what the Assembly did,” noted Decker. “The only difference is we clarified a few glitches in their bill, and we came up with a stable funding source. Right now we need to hear from the Assembly what they want.” Decker said he’d prefer it if both chambers would work off the Senate version of the bill, passed last week on the final day for fall floor session. Decker added he has not discussed the matter with Assembly Speaker Mike Sheridan, but that as soon as he does, there should be no hang-up in getting the bill on the governor’s desk.